Re:co is a gathering of the greatest minds and most influential thinkers in the coffee industry. This year, the coffee “C” price fell to its lowest point in 12 years, pushing below US$1.00/lb for the first time since Re:co’s inception. This price is a potent symbol of a shocking reality: coffee farming has been an unprofitable business for many producers for many years. Leaders in the coffee industry recognize that a crisis is underway, that its casualties are our partners, and that without them, there is no specialty coffee industry. But there is hope: individuals, companies, and organizations are addressing this crisis using new tools and different approaches to understand and confront the complex problems we face. This year’s Re:co will be about coming together to learn, collaborate, and act to address this challenge that faces all of us in specialty coffee. Growing Consumption: Letting Go of Sameness: We've become accustomed to specialty coffee consumption growing at a fast pace, but some signs indicate adoption may be slowing. Have we hit peak consumption within our target customers? What could we stand to gain if we became more diverse in our approaches and offerings? 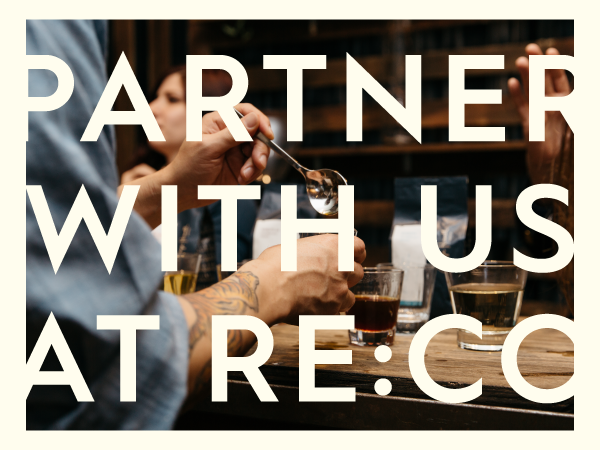 We tailor partnership opportunities to meet your brand's needs. Maximize your presence by sponsoring a portion of the event.